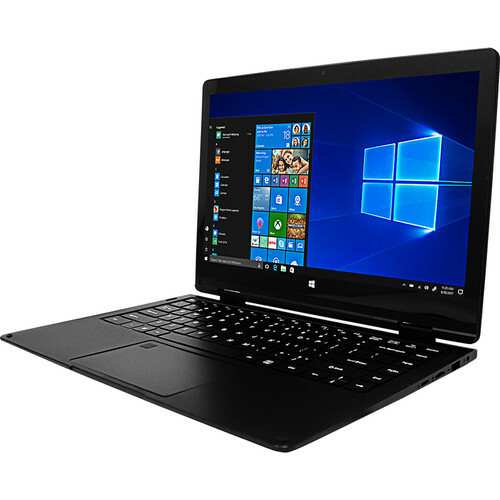 The 13.3" EV-L2IN1-133-2-BK 2-in-1 Multi-Touch Laptop from Evoo features a convertible design, which lets you flip the screen backwards for versatile viewing modes. Built with a multi-touch IPS panel, it provides you with wide viewing angles, vivid colors, and the ability to use touch gestures and commands within Windows 10 for enhanced efficiency and accessibility. Specs-wise, it's equipped with a 1.1 GHz Intel Celeron N3350 dual-core processor, 4GB of memory, 32GB of eMMC flash storage, and integrated Intel HD graphics. Other built-in features include USB Type-A and Type-C ports, a mini-HDMI port, 802.11n Wi-Fi, Bluetooth 4.0, a webcam, microphone, speakers, and a 3.5mm combo audio jack. The operating system installed is Windows 10 Home in S Mode. Box Dimensions (LxWxH) 14.4 x 10.0 x 3.0"